In amongst the brakes we’ve been testing for the past few months, there were a couple of brakes in the group that we’d had zero experience with prior. 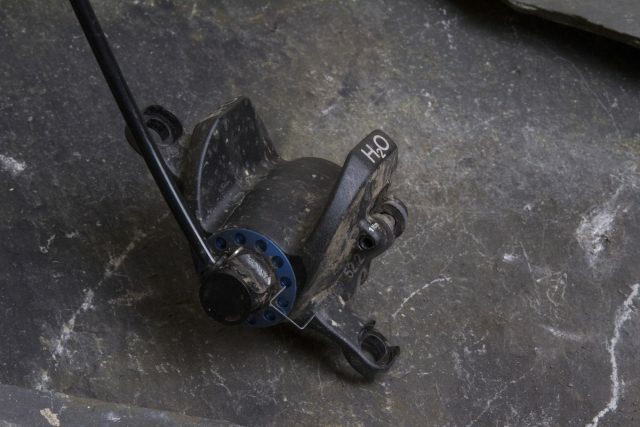 One of those brakes was the H2O from Brake Force One – a small German outfit that has been around since 2013 and is specialising in a unique high-end disc brake design. 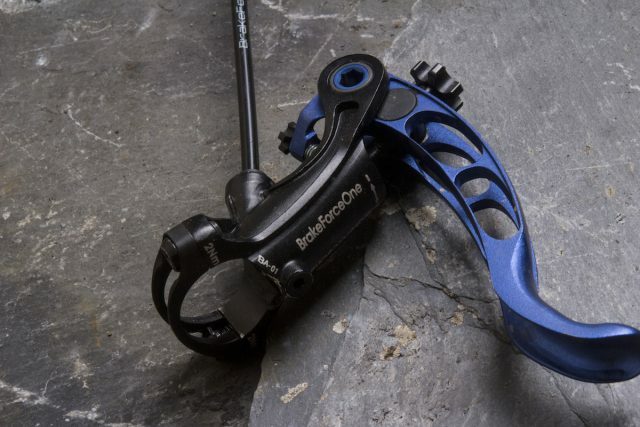 Brake Force One (BFO) launched it’s original brake four years ago, which used huge oversized callipers and a closed hydraulic system to deliver gobs of stopping power in a super light package. Most other brakes on the market use an open design with some kind of reservoir in the lever to compensate for fluid expansion as the brake fluid heats up under heavy use. In comparison, the closed system that BFO has no such compensation for fluid expansion, which means the pads will get closer to the rotor if the fluid heats up enough. 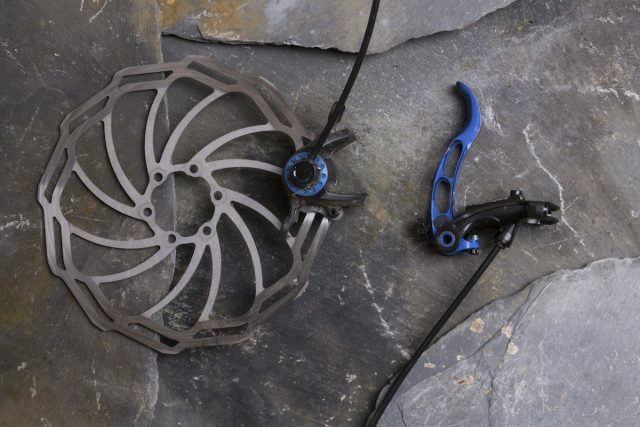 To get around this, BFO has built in more clearance between the pads and rotor, as well as a unique ‘Brake Booster’ system that controls the rate at which the pads accelerate towards the rotor. More on how that works later. They got water in them those brakes! Aside from using water, the H2O brakes also have a number of updates over the original BFO brake design. The Brake Booster is now inline with the calliper pistons, which has been done to eliminate the ‘dead end’ of the old design, improving the ease and consistency of the bleed process. 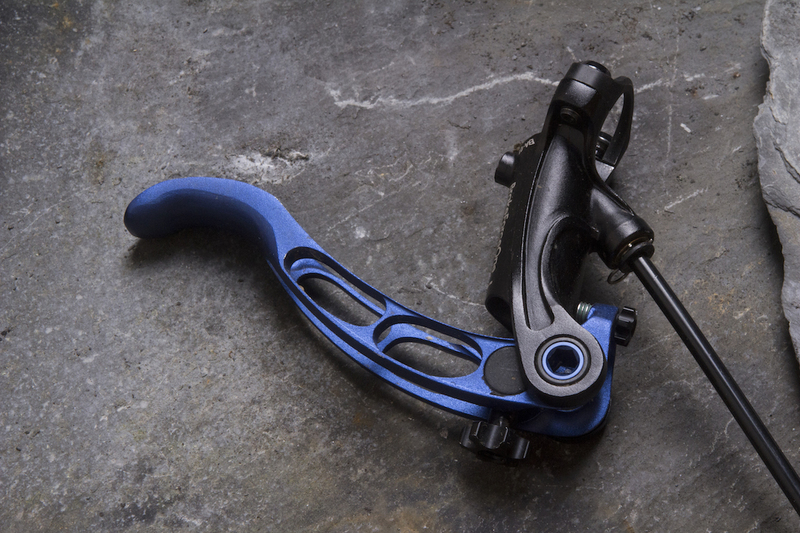 The levers are now made from machined and anodized alloy, with single and two-finger brake lever options. Although the pads and rotors are pads are made outside of Europe, most of the brake components are made in Europe, and assembly and finishing takes place in Tuebingen, Germany. The H2O is the latest brake design from small German outfit Brake Force One. Adjust lever reach and bite point with the two external dials. The lever looks nice, but it’s quite blunt, so it feels a lot thicker than it is. 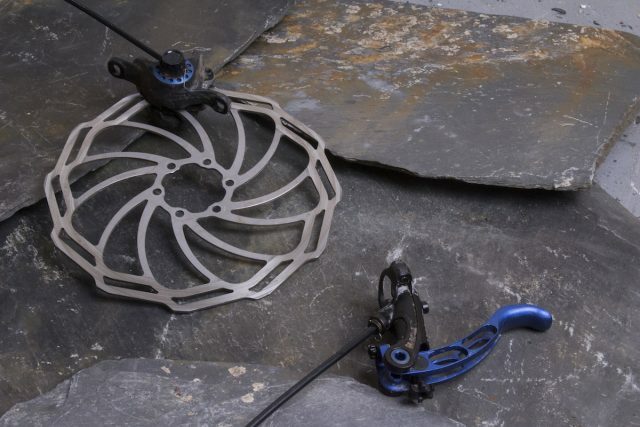 They’re certainly the lightest disc brakes we’ve ever tested, and the KCNC X7 and Trickstuff Piccola brakes are the only two we can think of that are lighter than these. However, weight doesn’t seem to be the biggest performance attribute that BFO is yelling about with the H2Os. 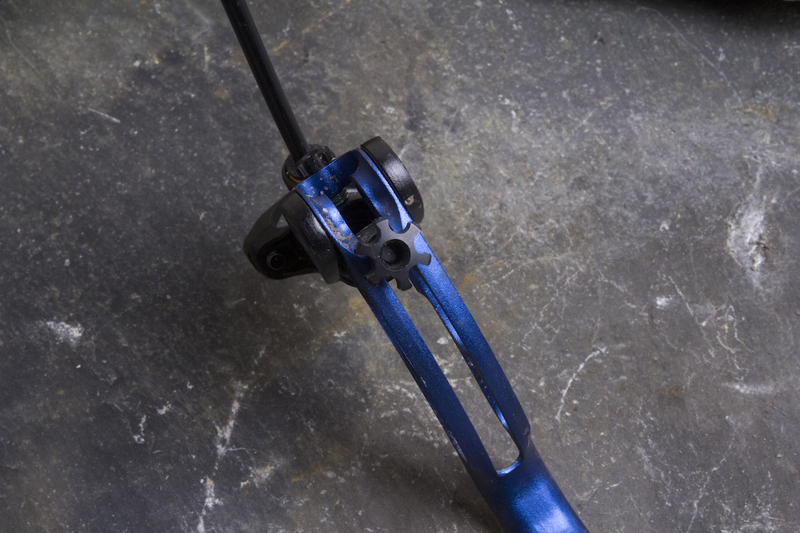 The ambidextrous lever bodies bolt to the handlebar with a split clamp and two small T25 bolts, and because of their narrow profile they don’t take up a whole lot of cockpit space. 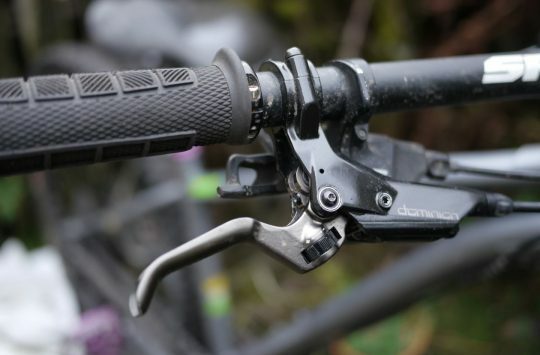 Fitting the levers alongside shifters and dropper posts wasn’t an issue, though BFO informed us that it’s working on MatchMaker-style clamps that’ll allow each brake lever to accommodate SRAM or Shimano shifter units. The machined alloy lever blades themselves look lovely, though while they aren’t much taller than a Shimano lever (14.5mm vs 13.9mm thick), the H2O lever blades are very blunt on the outside face. This means a lot of finger is required to wrap around each blade, which if you’ve got more slender digits like me, isn’t as comfortable. The H2O levers take up little space on the bars. But adjusting the bite point and lever reach isn’t as simple as it sounds. There are two dials on the lever, with the small inner dial adjusting lever reach, and the outer dial changing the bite point. Like a Hope Tech 3 lever, these adjustment dials are inextricably linked – so adjust one, and it’ll effect the other. 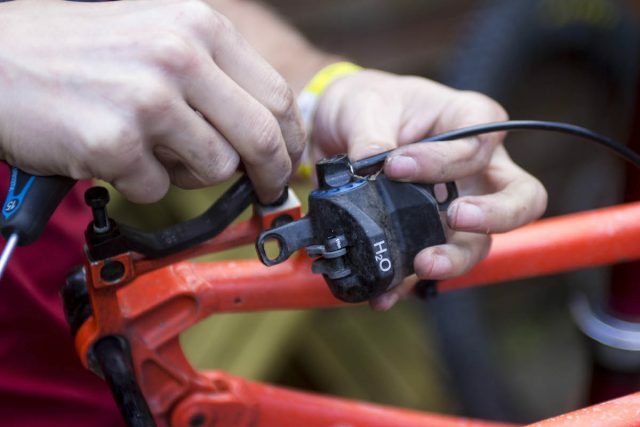 However, compared to the Hope Tech 3 lever, the H2Os leave a lot to be desired in terms of usability and finish. Basically with these you set your lever reach, then you have to wind in the bite point until it firms up. If you don’t, the lever rattles about with too much freeplay. This was pretty annoying, and it meant the levers weren’t actually that adjustable. We also thought the stuck-on rubber pads on the inside of the lever clamp were rather cheap, and after a few installs and removals, the pads were already coming unstuck. At the other end of the slender hydraulic lines, the callipers appear to have been lifted from some kind of quad bike. The huge alloy blocks house 22mm diameter pistons – the same size as what you’d find in a Shimano XT brake. Setup is a little more of a faff, because the callipers aren’t open through the backside, meaning you don’t have a window to peek through at the pads and rotor during alignment. That also means the pads are bottom-loading, which isn’t a deal breaker, it just takes more time to set them up. Bleeding the H2O brakes is a simple process, not unlike bleeding a Reverb hose. Otherwise we found trimming lines and bleeding the brakes very easy. 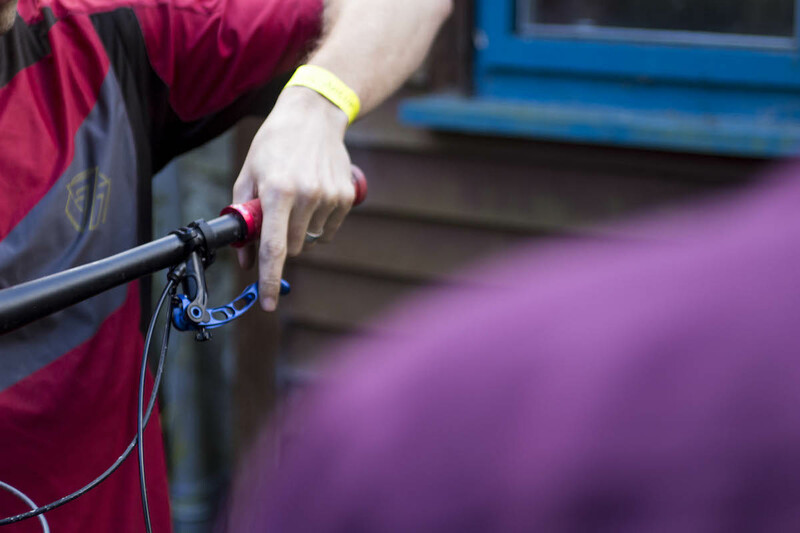 The hoses use quick-release fittings that did make us a little nervous, though the pins that hold the fittings in place proved sturdy and reliable throughout the entire test period. BFO also sent us a bleed kit with some spare fluid along with the brakes. The whole process is akin to bleeding a Reverb hose – one syringe at each end, and you simply pass fluid back and fourth to draw out any excess air. It becomes apparent from the very first lever pull that the H2O brakes feel like no other brake you’ve ever used before. There is almost no deadstroke in the lever, meaning the pads engage the rotor near-instantaneously as you squeeze the lever blade. 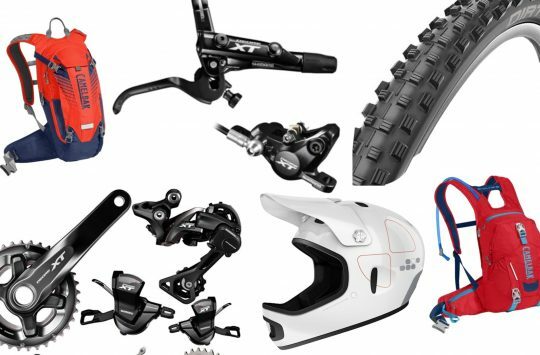 This is due to the closed hydraulic system of the H2O, which in terms of feel, shares more in common in with the brake pedal in your car than any other bicycle brake. You know how the brake in your car feels like it engages as soon as you push your foot down? That’s how the H2O brakes feel. 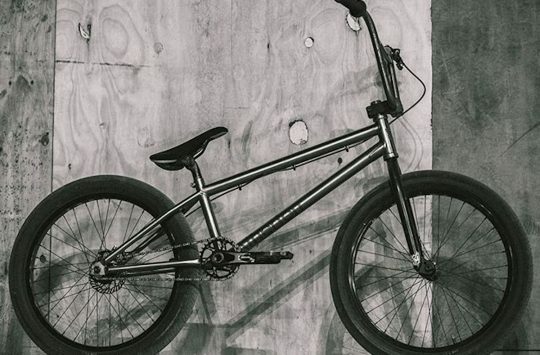 Because of this lack of deadstroke, it does mean you’ll need to set the levers in much closer to the grips than you would with a regular brake. Like the lever feel, the performance of the H2O brakes is a little love or hate. 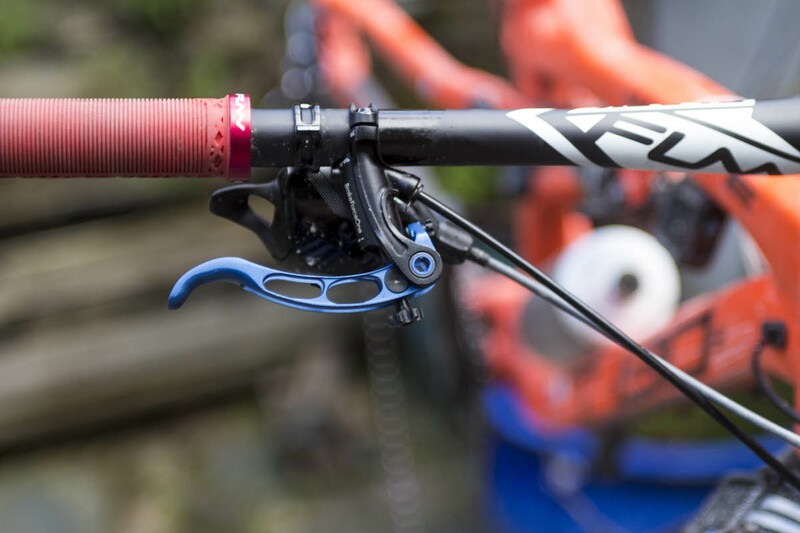 There is a raucous amount of power on tap, with more stopping force available than a Shimano Saint and a Magura MT7, though not quite as much as a Trickstuff Direttissima. However, the brake force doesn’t arrive in a totally smooth manner. This is due to the two-stage Brake Booster, which creates a distinctive power curve, or perhaps, a lack thereof. There’s loads of movement to begin with as the pistons rush the pads in towards the rotor quickly to take up that extra clearance. The initial modulation comes on gradually and in a linear fashion, and they feel innocuous enough as the pads gently scrub at the rotor surface. As you pull further on the lever though, the Brake Booster switches stages and the power ramps up dramatically. You do need quite a lot of lever force to access that power though, and it takes a good few rides to get used to locating where this change of power occurs in the lever stroke. I certainly locked up the tyres accidentally on numerous occasions during my first few runs with the H2O brakes. As I got more used to them, I found the H2Os on/poff feel actually encouraged me to stay off the brakes, helping me to avoid panic braking in the first place. It takes a good bit of saddle time to get used to the unique feel of the H2O brakes. 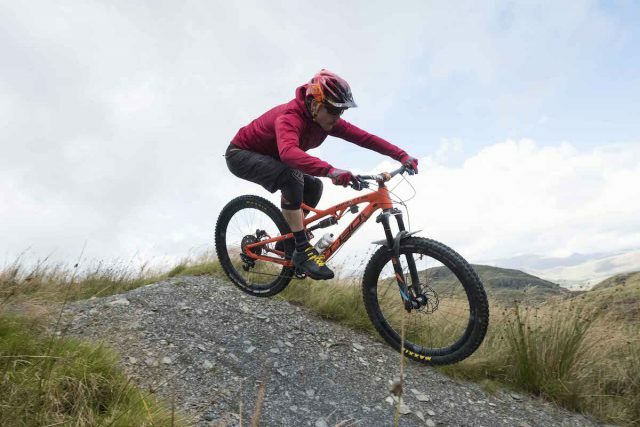 As we did with all of the test brakes, I spent a couple of downhill runs at Antur Stiniog dragging the H2O brakes to see how they were affected by heat and fade. Fading didn’t seem to be an issue with the organic brake pads, but at the end of a long descent back down at the carpark I did notice a light ‘shhh shhh shhh’ noise coming from the pads dragging on the rotors. After about five minutes, the noise went away, presumably as the callipers cooled down and the pistons retracted far enough. I suspect this is due to the closed system, which means the pads do creep in towards the rotor as the fluid heats up on extended downhills. It wasn’t enough of an issue to be noticeable on the trail, but if the smallest noises give you the irrits, then it’ll probably bother you. We spoke with BFO about this, as well as the rattly levers. According to BFO, there have been some changes to the H2O brakes since we received our test set, which include the use of a new brake booster design, a new coating for the pistons, and redesigned seals that offer a higher initial tension. We haven’t tested the updated brake design yet, but the changes may very well solve the issues we encountered. If we get another test set in, we’ll be sure to detail any change in performance. The H2O was the lightest brake on test, and one of the most powerful too. Though we still think there’s room for improvement in terms of finish and lever feel. Amongst all the other brakes we’ve tested before, the H2O brakeset from BFO offers a truly unique design and equally unique performance. And depending on how you like your brakes to feel, you’ll either be into that, or not. As an example, within our own test group there was one rider who absolutely detested the lack of a smooth braking curve with the H2O brakes, while another loved the on/off feel. You say tomato, I say tomato. However, none of us were impressed with the lever adjustability, and some improvements in the shape of the lever blade itself would go someways to improving feel. We’d also be interested in trying out the new version of the H2O to see if the internal changes address the heat expansion we experienced with our test brakes. There’s no denying the H2O brakes are very light and very powerful, but we still think BFO has some ways to go in terms of finish and ergonomics before we could recommend these over the bigger players in the braking market.